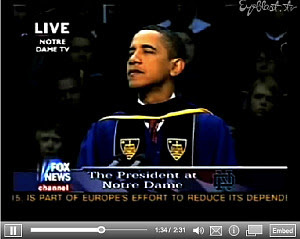 Fighting Irish Thomas: Saving Notre Dame: Looking back at Jenkins, Barack—and "the crying baby"
Saving Notre Dame: Looking back at Jenkins, Barack—and "the crying baby"
In my last of a series of reflections on Barack Obama's Notre Dame appearance, I will focus on the speech itself and Fr. Jenkins' words (and lies) leading up to it. While many pro-lifers now seem sad that there was no one in the arena (save a few brave hecklers) to counter the cleverly deceiving abortion addresses by the priest and the president, I contend their lies were subtly undercut by the most poetically appropriate protestor possible—the cries of a baby. As expected, many mainstream newspapers and online publications agreed with the Chicago Tribune's pro-Jenkins', "gotta love Obama" review of the event. After saying that Jenkins was unfairly "scorched for weeks by some [try over seventy!] bishops and members of the faith" for honoring Obama, this Tribune editorial added, "Jenkins spoke with passion about the Church's opposition to abortion, and about why Notre Dame was acting in the Catholic tradition when it invited the president and gave him an honorary degree," concluding, "Fr. Jenkins and Notre Dame in turn earned a great deal of respect." What the paper didn't say is that while Jenkins used cool Catholic papal quotes like John Paul II's "a Catholic university should be a primary and privileged place for a fruitful dialogue between the gospel and culture," and that the brave soul Obama came to Notre Dame, "though he knows full well that we are fully supportive of the Church's teaching on the sanctity of human life, and we oppose his policies on abortion and embryonic stem cell research," there was really no dialogue—or opposition—because Jenkins never said why the Church—or he—opposed them. And so when Obama gave his well-written, wonderfully delivered, and (to the average ill-informed student and viewer) highly believable pro-abortion/embryonic stem cell research commencement address, no one was there to "dialogue" except for three or four pro-life hecklers, who were swiftly and brutally hustled out of the stadium, if not the country (you see, Mr. President, there is a reason to keep Guantanamo open!) and they were gone long before phrases like, "Human life must be respected and protected from the moment of conception," and "every abortion is a gravely, moral evil ... the Church attaches the penalty of excommunication to ... formal cooperation to this crime" (Catechism of the Catholic Church 2270-2272), could be uttered. But if these reasons aren't enough to explain why Father shouldn't have invited Obama to give Notre Dame's commencement (and why Jenkins should be excommunicated) let the Tribune and all fair-minded critics once again examine how this so-called respecter of "Catholic Tradition" and "the Church's teaching" totally ignored—then mocked—both of them to get the President of these Abortion States to come in the first place. Speaking of Church teaching, not only Catholics, but many non-Catholics are now aware, due to the Notre Dame decision, of the US Conference of Catholic Bishops' statement entitled, "Catholics in Political Life." After saying that not only abortion is "always intrinsically evil and can never be justified [and] to make such intrinsically evil actions legal is itself wrong," they conclude with the rather staightforward teaching that "Catholic institutions should not honor [their emphasis] those who act in defiance of our fundamental moral principles. They should not [my emphasis] be given awards, honors or platforms which would suggest support for their actions." Now, if Father had read this statement and (openly) said, "To hell with those bishops! Having Obama here will bring me—and of course, the University—honor in the eyes of all those who really matter," and then invited him, I suppose I could at least have respected him as a man. Of course, Jenkins wouldn't have lasted long as University president then either, and, wanting to have it both ways, came up with the following plan. In order to justify himself, he said that he interpreted the bishops' statement about Catholic institutions not honoring pro-abortion politicians as only applying when the politicians were Catholic, since the document was called "Catholics in Political Life." Having taught grade school, I can assure you that the average fifth grader can tell you with complete confidence that in this case, the word "Catholic" describes the word right next to it, "institutions," and not the phrase up on top of the paper. So either Fr. Jenkins is not smarter than a fifth grader, or he is a complete and utter liar. Of course, the fact that Father Jenkins is less moral than the average fifth grader is beyond question; for any student knows that if they have any doubt about which answer is right or wrong, all they need do is ask their teacher, but rather than ask his own bishop the question, Jenkins instead said he found several lawyers (lawyers?!) who agreed with his decision. This point cannot be emphasized enough; while faithful Catholics know that ignoring your bishop is inexcusable, all men of good will must realize that justifying something with a lie is just plain wrong. In addition, since every Bible-believing Christian knows that Satan is "the father of lies" (John 8:44), they too would have a hard time believing that Jenkins' "un-truth" (I forgot that Homeland Security considers the word "liar" hate-speech!) was inspired by the Father of Our Lord Jesus Christ. Speaking of John 8:44 ("When he tells a lie, he speaks in character,") Barack Obama's ND speech was as witty, welcoming ... and as full of baloney as we have come to expect. While there were a few parts of the talk I actually agreed with; for example, his admiration of intramural Irish basketball (the president actually would be a good fit on the "Barack O'Ballers" team) I, like most pro-lifers, was initially depressed that he delivered his pro-death speech at "the flagship Catholic university" virtually without a hitch. Yet, when he started talking about coming together about lessening abortions (which is, considering what his first 100 days' abortion record has been, a huge joke, although not the funny kind) I could have sworn I heard a baby cry. Wondering if it was my imagination, I later listened to the speech online, and I heard it again, coming almost at the exact time Obama began to promote abortion. "It wasn't us," said Randall Terry's Operation Rescue spokesman, Joe Landry. "The baby was legit." Indeed, while the timing was so perfect that I have a hard time believing it wasn't a recording, none of the various pro-life groups took responsibility. In the end, whether the cries came from a real baby, a well-placed sound system ... or heaven, doesn't really matter. What is important is that just as the thousands of peaceful (which included an alternate graduation for 26 pro-life Notre Dame seniors) and not so peaceful protests (over 40 arrests, including former Obama Senate opponent Alan Keyes and Norma "Ms. Roe v Wade" McCorvey) stole Obama's thunder outside, a single baby wrecked the president's messianic persona from within. For just as an ultrasound dampens the desire to have an abortion for most would-be mothers, even the most impressive pro-choice speech doesn't sound quite right over the strains of a peacefully moaning infant. True, Barack's guys could erase the baby's cries off the official Internet sites (just as they did the Homeland Security report that called pro-lifers "terrorists") but I'm sure there are more than enough bootleg recordings to keep it alive forever. In the final analysis, the millions of prayers to Mary for Her University not only worked this wonder, but kept the campus' many Christian monuments and symbols from being covered up, while at the same time covering the president in robes that proclaimed Mary, the patroness of the pro-life movement, "Our Life, Sweetness, and Our Hope"—a minor miracle in itself. And so, though the war may be far from over, when the smoke cleared on the battlefield of this day of reckoning, it was Notre Dame, not Obama or Jenkins, who won over all.